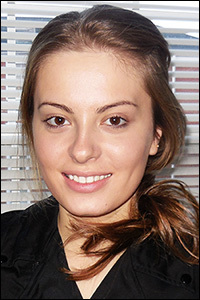 "The best thing about my undergraduate research experience is really enjoying what I do. [It] gives me a sense of who I am and helps me balance research with my classes, job, and extracurricular activities." Clark School Fischell Department of Bioengineering (BioE) sophomore Mian Khalid (who also majors in English) has been awarded a Howard Hughes Medical Institute (HHMI) Undergraduate Research Fellowship to further the development of a lighter, safer, and flexible solid polymer electrolyte option for lithium-ion batteries. 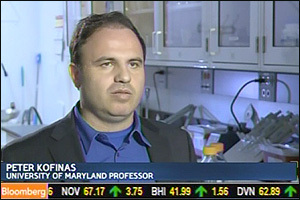 Khalid is advised by BioE professor and associate chair Peter Kofinas, and conducts his work in Kofinas' Functional Macromolecular Laboratory. 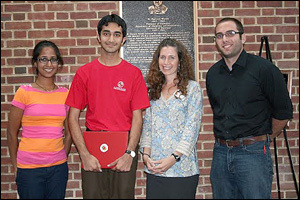 The competitive HHMI Fellowship program, sponsored by the Howard Hughes Medical Institute and the University of Maryland's College of Computer, Mathematical & Natural Sciences, supports the research activities of undergraduates working under the direction of a faculty mentor. The program's goal is to give talented students the opportunity to immerse themselves in the investigative process, increase their aptitude for research, collaborate directly with faculty, and strengthen their dedication to a career in medical, biological or life sciences. Khalid is working with Kofinas and fellow group member, Department of Chemical and Biomolecular Engineering graduate student Aaron Fisher, on the synthesis and processing of shape-conforming polymer electrolytes that can be used in lithium-ion batteries, particularly those destined to power biomedical devices. Commercial carbonate-based liquid electrolytes, currently found in batteries used in everything from cell phones to pacemakers, can overheat if they short out, igniting and causing the battery to explode. The electrolyte Khalid works with, however, is non-combustible. "Safety is extremely important in biomedical devices due to their close, consistent, and often long-term contact with patients," he says. "Despite rigorous regulatory oversight, there have been recalls of implantable and external defibrillators, insulin pumps and pacemakers due to lithium battery malfunctions." The goal of his work, he says, is to help create products that assure patients and physicians of their safety. The project seems to be moving in all the right directions. Khalid, Fisher and Kofinas launched a company called SafeLiCell to promote the commercialization of the patent-pending electrolyte, which has been named Lithium Flex. 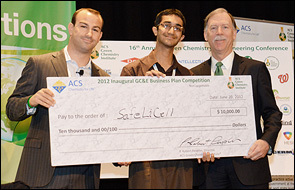 In April 2012, SafeLiCell was chosen to represent the University of Maryland in the inaugural $100K ACC Clean Energy Challenge business plan competition. 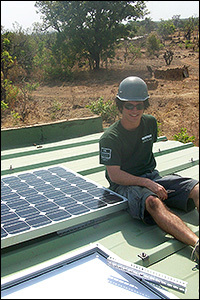 The company took second place and received a $15,000 prize to be used toward the further the development its product. 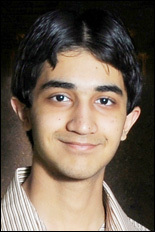 As a freshman, Khalid approached Kofinas with a request to join the professor's group. "He was generous enough to see my ambition to be really involved with his research at [such] an early stage of my undergraduate career," Khalid says. 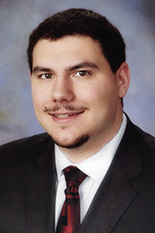 Kofinas and Fisher have served as his mentors ever since, and he credits them with teaching him the "discipline of research." "The best thing about my undergraduate research experience is really enjoying what I do," says Khalid. "[It] gives me a sense of who I am and helps me balance research with my classes, job, and extracurricular activities." Khalid says the recognition of his work has been both exciting and fulfilling. He expects the HHMI Undergraduate Research Fellowship to help him focus even more. "[It's] giving my project a new sense of direction," he adds. "I will be utilizing both bioengineering and chemical engineering principles to have a real impact on the biomedical device industry." Khalid joins an accomplished group of the HHMI Undergraduate Research Fellows who either majored in bioengineering and/or were advised by BioE faculty, including Maria Ansar (biochemistry and cell biology & molecular genetics), advised by BioE assistant professor Silvia Muro; Joshua Thompson, advised by BioE associate professor John Fisher; and Apoorv Gupta (chemical and biomolecular engineering), advised by BioE professor and chair William E. Bentley.